The U.S. Administration has been advocating for greener technologies in the automotive industry over the past few years, encouraging American consumers to do their part by purchasing plug-in hybrids and all-electric vehicles. During his State of the Union speech in January, President Obama announced that he wants 1 million of these alternative cars on our roads by 2015. 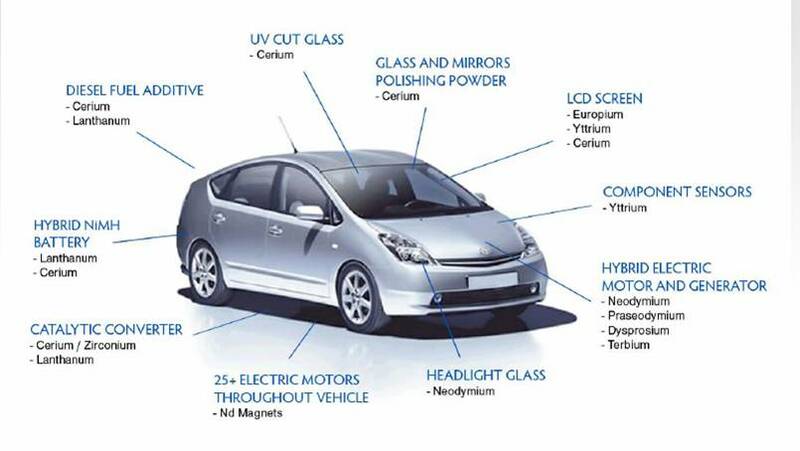 What does the U.S. auto industry have to do with Rare Earth Elements? The current grip-hold China has on the REE market could easily impact the cost of the products the President is urging American manufacturers to make more of and asking consumers to purchase. Rare Earth elements essentially make all of these emerging technologies work. Rare Earths are used in a number of automotive applications such as catalytic converters and other auto parts. The batteries that power plug-in hybrid and electric vehicles (such as the Chevrolet Volt and Nissan Leaf) require some REEs in combination with Neodymium permanent magnets, which is a light Rare Earth element. However, manganese (not a REE but 100 percent imported by the U.S. due to lack of our own deposits) is most commonly found in newer lithium-ion batteries.